An obscure law passed in 1937 under President Franklin Delano Roosevelt has been standing in the way of economic development in Old Town and Congressman Bruce Poliquin has been fighting to fix it. The Bankhead Jones Farm Tenant Act, passed in 1937, was designed to allow the federal government to purchase land that had been damaged and rehabilitate it, primarily for agricultural purposes. Land in Old Town was purchased under this act. Nearly five decades later, this federally owned land was sold to be used as part of the Old Town Airport, however, the deed restrictions of the Bankhead Jones Farm Tenant Act were left in place. As Old Town officials sought additional development in the region in early 2017, it became clear that the deed restrictions on the land were prohibitive to development and they sought assistance from Congressman Poliquin. 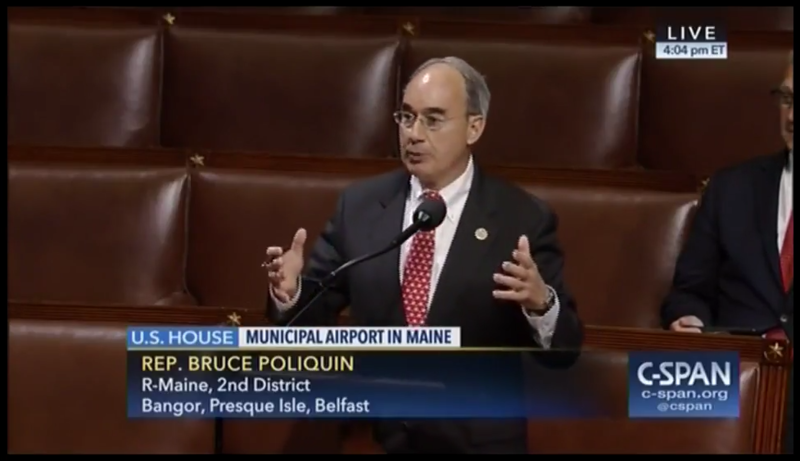 Congressman Bruce Poliquin speaks in support of his bill to fix Old Town airport deed restrictions on the floor of the United States House of Representatives. 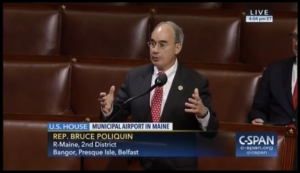 In May, Congressman Poliquin’s bill to overhaul the complex restrictions placed on the Old Town property passed the U.S. House with broad bipartisan support in a 418-1 vote. Since passage in the House in May, however, the bill had appeared to languish in the U.S. Senate as high profile issues, judicial appointments and confirmation hearings took precedent. That changed this week with the announcement that the U.S. Senate would roll Poliquin’s bill into a larger bill, the Federal Land Management Act of 2017, which was passed with unanimous support on the Senate’s Agriculture Committee.